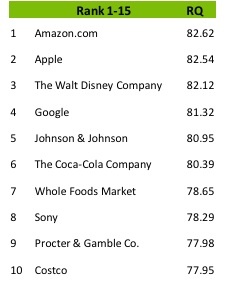 Amazon(s amzn) is the most widely admired U.S. company, edging out last year’s favorite, Apple(s aapl), according to the new Harris Interactive Poll on most reputable companies. The online book seller and cloud services provider ranked in the top five in five of six criteria and its combined reputation quotient or “RQ” score was 82.62. Apple scored 82.54. Harris takes factors including quality of products and services; workplace environment; social responsibility; financial performance; and emotional appeal to calculate the RQ, querying some 14,000 respondents. Bank of America remained in Harris’ bottom 5 companies, but also saw the largest reputation rebound of 6 points. NTT, Japan’s gigantic telco is making Cloud Foundry the basis of its upcoming Platform as a Service. It joined Cloud Foundry Core, a push launched last year by VMware to make its open-source Cloud Foundry the basis for a slew of compatible higher-level PaaSes. And a bunch of companies — AppFog, ActiveState, Uhuru, and Tier 3– now all offer Cloud Foundry-based platforms. The Cloud Foundry Core Definition baseline includes runtimes and services built on Java, Ruby Node.js, MongoDB, MySQL, PostreSQL, RabbitMQ and Redis. VMware launched Cloud Foundry two years ago but is now in the process of spinning that work off into the Pivotal Initiative, a move which has some members of the Cloud Foundry ecosystem worrying about what changes could be in store. Fearing that cloud computing companies will flee for business friendlier environs, several states are moving to remove sales taxes levied on cloud computing services. Last week, a legislative panel in Idaho agreed to hammer out that topic once and for all, according to the Idaho Spokesman Review. The Idaho House’s tax committee said it will introduce legislation that will classify cloud computing services as, well as services, not tangible physical goods the sales of which are taxed. Nineteen years ago, a state law held that software is taxable regardless of how it is delivered. Meanwhile, cross country in Vermont, Governor Peter Shumlin is also working to remove a state tax on cloud services, according to VTdigger.com. Shumlin’s administration “backed a retroactive cloud computing moratorium that reimbursed businesses for about $2 million in taxes that had already been collected. This time, the proposal would make the exemption permanent,” according to the publication. Removing yet another source of revenue from cash-strapped states is bound to stir up controversy however. So Sony is no longer a technology company?